I wanted to quickly share a follow up on my refinished hardwood floors, and my decision to use Waterlox to seal them rather than polyurethane. And let me make this perfectly clear — this is not a sponsored post. The good folks at Waterlox don’t know me from Eve, and I didn’t receive any free products from them. I simply did my own research (lots and lots of research) and considered everything from polyurethane, tung oil, Waterlox, and even a couple of other things. And I finally decided on Waterlox. And then I purchased my products online, and paid full price, just like you would have to. But when I come across a product that I truly believe in, I like to pass that info along to y’all. Well, during that time, I was researching like a crazy woman, trying to decide how to seal my hardwood floors. Do I want to use polyurethane? Should I stain them first? What if I don’t stain them, and then they don’t come out dark enough for my taste? What if I stain them and they come out too dark? What about tung oil? I nearly drove myself crazy with indecision, afraid that I’d make a terrible decision. Ahhhh…they were gorgeous and perfect (I mean, as perfect as 65-year-old hardwood floors can be). 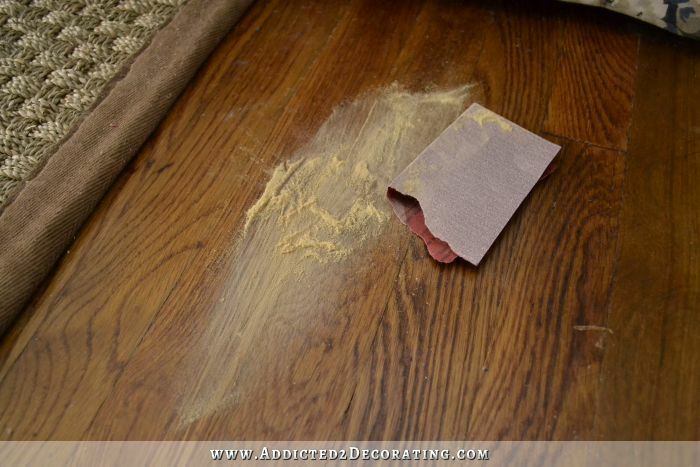 But of course, over time, hardwood floors get scratched from everyday use. Especially when someone as independent and (yes) careless and I am lives in the house. Let’s just say that dragging heavy furniture around (like a sofa) all by myself has left some pretty sad looking gouges in my hardwood floors. But here’s where the real beauty of Waterlox kicks in. This is one of the main reasons I finally settled on Waterlox over every other finish — the ease of repairing scratches in the floor. Don’t try this with polyurethaned floors. It won’t work. When I get a scratch like that, I simply grab some sandpaper (120-grit in this case, just because it’s the first one I found), and I sand the area so that it’s pretty smooth. And then I just added more Waterlox right on top. I took that picture right after I added the new Waterlox, and it’s still wet. (And I did this about an hour ago, so even now it’s still wet. It takes several hours to dry.) But even wet, it still looks so much better already! Once that’s dry, I’ll probably add one more coat. After about two coats of Waterlox, the color stays pretty consistent. In other words, unlike stain, it doesn’t keep getting darker with each new coat. The depth of color maxes out on the second or third coat (depending on how thick the coats are). And here’s a zoomed out view. I really don’t think that anyone would be able to tell that there was once a 5-inch gouge in the floor right there. I love that about Waterlox. And generally if I do this right before I head to bed, it’s dry enough to walk on by the time I get up in the morning. Isn’t that awesome? That benefit alone is probably the single thing that sold me on Waterlox for my floors. 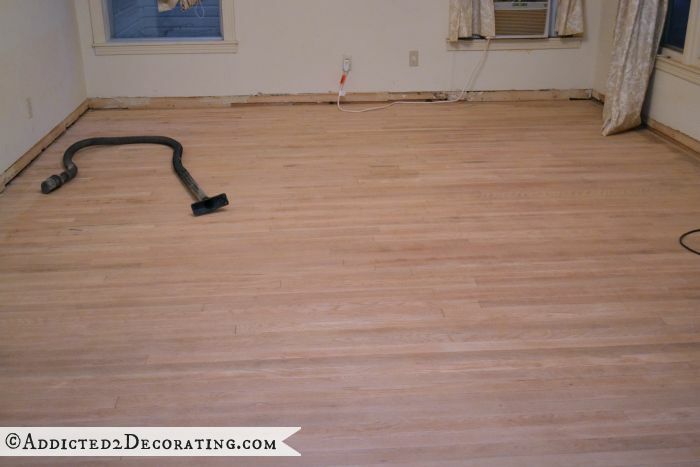 I’m so glad that dealing with scratches from here on out will never require a whole-house or even a whole-room sanding and refinishing of the floors! Amazing! I think you’ve sold me on Waterlox for my floors. (Still can’t believe you refinished all of yours by yourself!!) Thanks for sharing, Kristi. Kristi, what type of sander did you use for your living room? How long did it take? Your floors are gorgeous and mine really need to be redone but I’m kinda nervous to tackle that project but not willing to hire anyone either! Kristi love it! Not certain if you answered this question but would love to know the exact Waterlox products you used? Please and thank you. I used two coats of Waterlox Original Sealer/Finish followed by one coat of Waterlox Original Satin Finish. 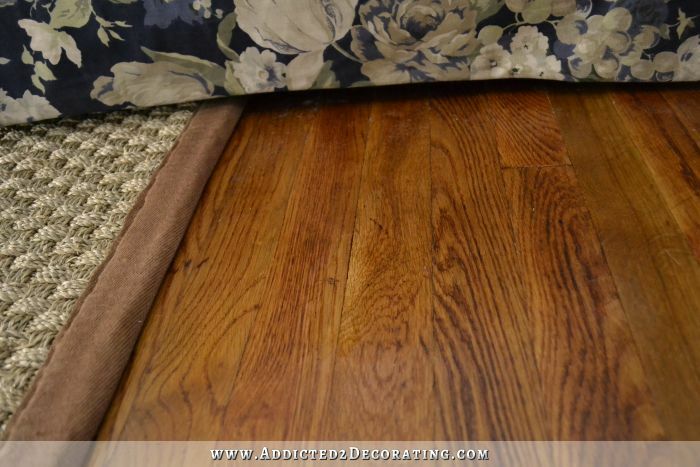 Hi Kristi, I really like the idea of using Waterlox on my floors when we refinish our hardwoods this spring, thanks to your review. I am wondering if stain can be used with this product, and if so, do you think it would be as easy to repair scratches in it as it seemed to be for you without using a stain? Hello Im wondering if this comes in different shades? Only because I would like a darker finish. The Waterlox itself only comes in one color, kind of like oil-based polyurethane only comes in one color. If you want darker floors, you’ll need to either stain the wood before applying Waterlox, or add a bit of stain to the first coat of Waterlox. Thank you so much for sharing this,I have been lamenting over what to use in a very busy house .Think we will give it a try! It’s called a drum sander, and it’s the only kind I would recommend. Do NOT use the one called a square buff. And I won’t say that it was completely easy to use, but it wasn’t difficult either. I watched a few videos on YouTube of people using a drum sander to get the idea of exactly what I needed to do, and that gave me a bit more confidence. Kristi, you need yourself a set of furniture slider thingys to put under the legs of your furniture. With all the moving around of stuff, they would make it a breeze and not harm the floors. I use them all the time and have no problem moving desks, beds, couch, armoire, etc. on hardwood floors and carpet all by my little petite self (I said petite, because of height only and will leave it at that LOL). I agree. You need a set of those mover pads. It’ll save a lot of wear and tear on your furniture, floors and most of all, your back! Love your floors and it appears that the Waterlox is perfect. I was wondering if I could use the Waterlox on a couple of spots on my floor now if it is sealed with a water based polyurethane. Thoughts? Thanks, and you floors look great! No, it really needs to be used on bare wood floors. If you have polyurethane on them, you’ll need to sand your floors before using Waterlox. I echo what the girls said above about the mover pads. For hardwood just put a small square of cut up carpet (with the soft side down) under all legs and moves like butter. For carpet you use the hard plastic discs that are sold for that purpose…..not only does it save floors, it saves backs too! I can empathize with you about the puppy puddles! 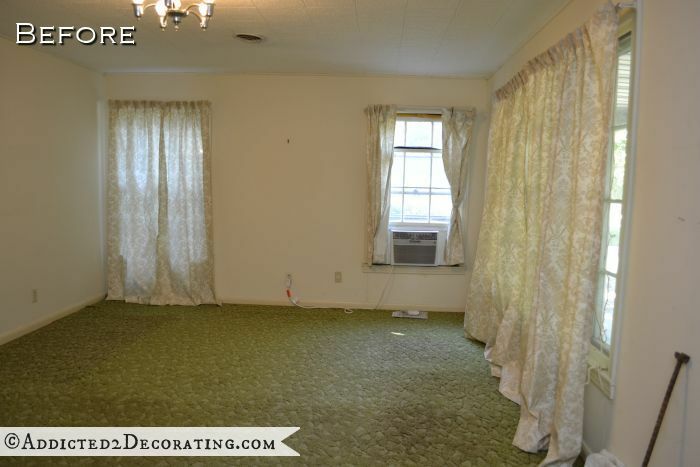 I can’t wait to rip out all my carpet and replace with hard surface. Cool. I didn’t know such a product existed. I’m on a slab and must use floating floor- possibly engineered wood. Have you ever used any of these products? Any suggestions would be greatly appreciated. No, I’ve actually never used an engineered wood floor. You’ve sold me on waterlox also. 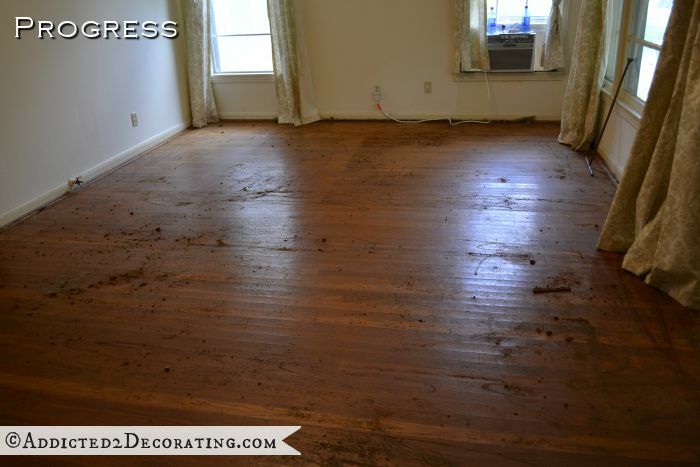 We plan to have our hardwood floors redone this summer. We’ll make sure the contractor uses waterlox. Would waterlox be good to use on a bathroom counter made of wood? I am turning an old buffet into a bathroom sink cabinet, I love the wooden top and really would like to keep it … But I don’t want the super shiney look of poly. And I love the look of your floors! Waterlox comes in several finishes – original, satin and high gloss. 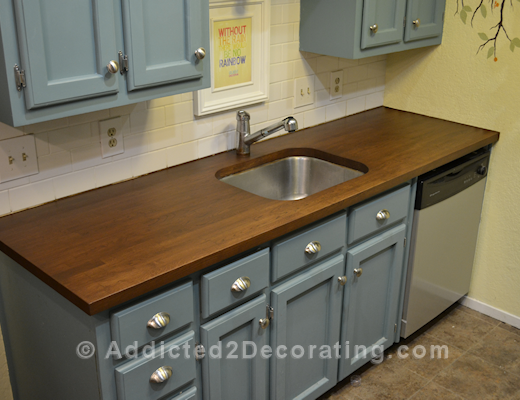 I used the satin to seal my (MInwax walnut) stained IKEA butcher block countertop on my island and I love it! For those asking about dark staining with Waterlox – you will still need to stain (with something like Minwax) before applying the topcoat of Waterlox. Waterlox is only a sealer/ protectant for wood and provides minimal coloration. Yes, you could definitely use it on a bathroom counter made of wood. People use it to seal butcherblock in their kitchens. And it comes in a satin finish, so it’s not too glossy. I use old towels or rags under each foot when I’m too impatient to wait for someone to help me! Easier to move and no damage! Kristi, I’m always so glad when you recommend products that you find work good (or fantasitc)! On Sunday that made my day: I was repainting two old wooden chairs and had gone to some length to find Floetrol over here in Germany, as you recommended it. I had to get it via the internet as shops here don’t seem to offer it (yet? ), but that extra bit of hassle was worth it! I’ve never experienced such an easy painting process before! It looks better as well, as the surface is much smoother and doesn’t show so much paint strokes, so it really is a product to recommend, thank you!!! I’m so glad you liked the Floetrol, Karen! I absolutely love that stuff, and I just won’t EVER paint cabinets or furniture without it. Or if I do, I’m always disappointed. If you want to use Waterlox, your floors will need to be sanded down. Waterlox has to be applied to bare wood. Your floors look great. I too decided on Waterlox for our pine floors when we built. I also used it for my oak counter top and an oak mantel. I swear by this product (and I am not sponsored by Waterlox either). In fact, my husband is a lumber salesman and his company doesn’t carry the product so I drove over State lines to purchase (at the time I could not get the gallon size in Massachusetts due to VOC regulations). I did 4 coats and if I remember correctly, purchased 30 gallons. I get compliments all the time. The Waterlox website is very informative and their customer service is great. Worth every penny and doing it myself was significantly less than the quote I got to have someone polyurethane the floors which would have involved sanding in between coats. 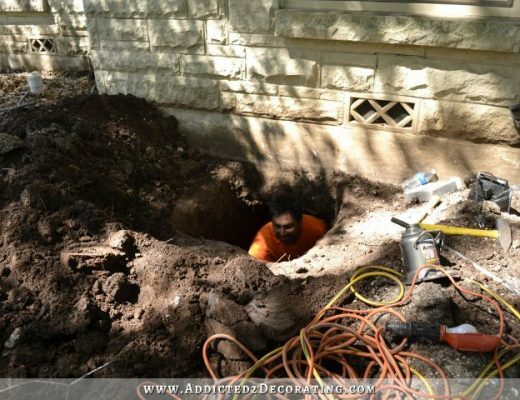 wow, I have an entry way that needs done seriously soon..gonna have to check this out! Thanks Kristi. 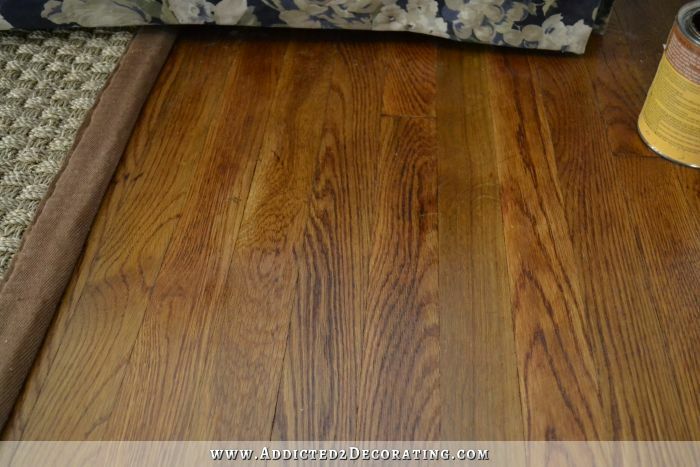 I have never used Waterlox on my hardwood floors. 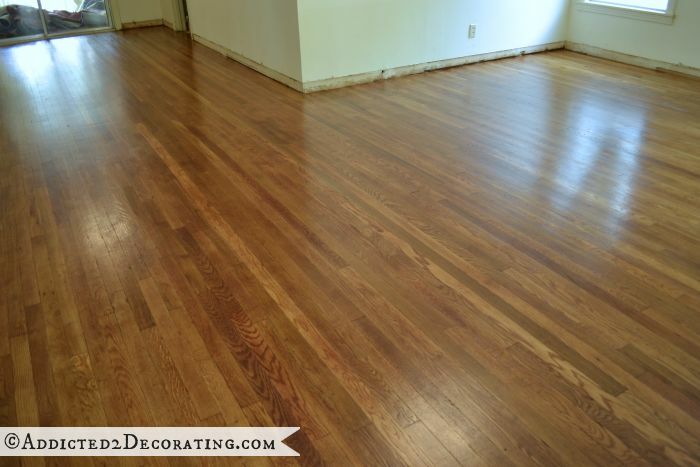 Our old home had dark hardwood floors and many flaws were still visible after refinishing them ourselves and using poly. Our new home has light hardwood floors. I might try the Waterlox on these. Your floors look fantastic! I need to refinish my hardwood floors. I saw your pics of your floors and they look great. I have two schnauzers and they run around a lot in the house and im wondering how the finish would hold up , like would the floors scratch easier then poly? 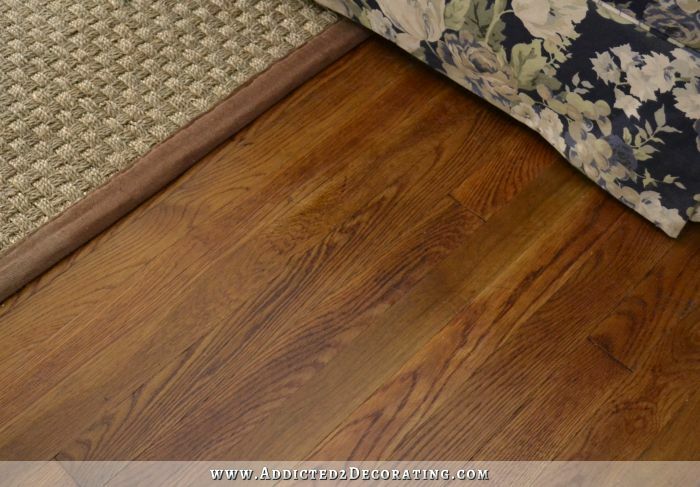 Your floors look absolutely stunning! Thanks for your recommendation of waterlox. We are having wood counter installed, and the company uses waterlox to finish them (there will also be an area with an oil finish that we can use for cutting). I’m so glad to see the process and how beautiful your floors turned out. We have polyurethaned kitchen floors that need to be refinished. I would love to use waterlox, but because the floors are continuous with the rest of the house (where the floors are still in great shape), we will probably need to use poly on them. I hate that repairs really can’t be made. The floors weren’t nice when I moved in. The two refinished floors, covered in gloss polyurethane are in moderate condition (I didn’t notice a few problems and there are SOME black stains)The product “Waterlox” suggests that it might be waterproof. Is it? Alternate product I was considering for the two back room floors: Marine Spar Varnish. If it can be applied to wooden boats, wouldn’t it be tomcat proof on wood floors? 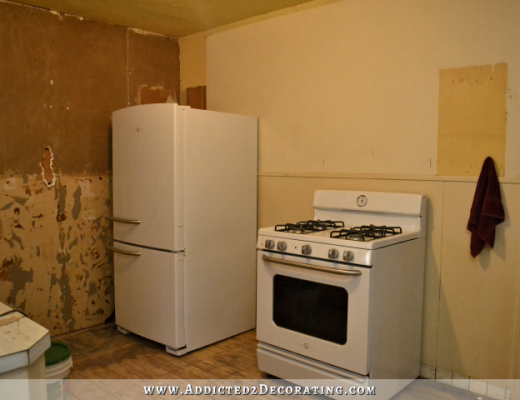 I REALLY don’t want sheet vinyl or tile in the back two rooms! When you’re applying the Waterlox satin finish to cover a small area that is scratched do you use a brush or cloth? I’ve used both, but I prefer a brush. 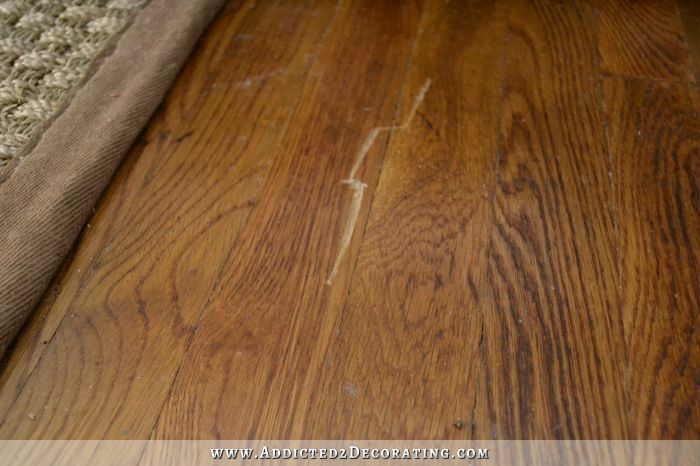 I’m using waterlox on my pine floors over 100 yrs old….sanded and ready! Wish me luck!! I did a home remodel. The kitchen had solid cherry cabinets. They were badly in need of refinishing. After much research I settled on Waterlox. Nothing reveals the beauty of wood better than this product, in my opinion. I would absolutely use it on my floors in my home. It DOES require good ventilation though. Here’s a link to a post I did on the project http://leisa-land.blogspot.com/2012/10/message-from-universe.html Though for some reason I don’t have an after picture! I keep coming back to this post! Such great info! It’s one of the few detailed blog posts about Waterlox out there. Any update on the floors or your satisfaction since you completed the project? I actually just finished remodeling my music room, and I made a complete mess of the floor. As I was mopping the floor tonight, I was thinking how unbelievably thankful I am that I chose Waterlox for my floors. I can do some spot sanding on the areas where I dripped paint, scratched the floor with my tools, etc., and give it another coat of Waterlox, and it’ll look beautiful again! If I had polyurethaned my floors, I wouldn’t be able to do that. They’d have to be completely stripped and refinished. I used professionally applied Swedish Oil finish on most of the house remodel and applied Waterlox by myself on an old floor in the living room. 15 years later, the Waterlox has worn better, is easy to spot repair (I agree this is the best part!) and looks great. I also took the poly junk off my wood counters and used Waterlox last year, since I use cutting boards anyway. Looks beautiful and easy to fix scratches! Multiple coats do take a while to dry and they tend to move and level out so best to leave the masking tape on for a while. Thank you for this post. I wasn’t sure if I could really do the whole house floors with Waterlox, but next time through that’s what’s happening! You floor looks wonderful! What is the drying time? Is there a finish for commercial as well? I only use Waterlox and it is wonderful. 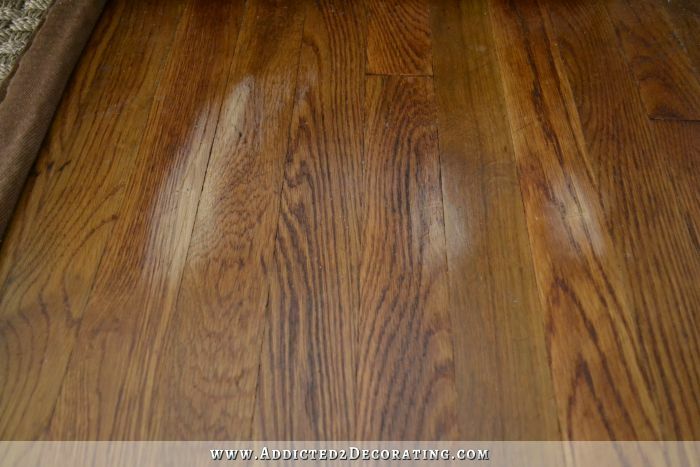 Waterlox is tung oil resin that penetrates into the wood and hardens. Polyurethane creates a coat on top on top of the wood. As a result, when you scratch poly, you have to redo the whole thing. But with Waterlox that is not necessary. Also, this penetration can give the wood a 3-D like appearance if the Waterlox is applied correctly rather than look like a plastic coating on top of the wood. I also find Waterlox much more forgiving, especially when my tabletops get marred. The downside/upside to Waterlox is the cure rate. With poly, I can “feel” the coat drying and thickening before I am finished when I am working on a large project like a table top. If I do not work quickly, I will end up with brush marks, bubbles or wrinkles in my finish. With Waterlox, I can take my time and work at my own pace, go over any area I want to without feeling hurried. However, this plus side is also a problem because unlike poly which you can re-coat in 8 hours, you can’t re-coat Waterlox for 24 hours. In addition, Waterlox recommends a 7 day cure rate after the final coat, but I know many woodworkers who recommend a 30 day cure rate instead. I have a tendency to cure the full 30 days.